"As schools across Massachusetts grapple with a recent surge in racist graffiti and anti-Semitic incidents, many educators say they are working to build programs into their curriculum to combat hate. As schools across Massachusetts grapple with a recent surge in racist graffiti and anti-Semitic incidents, many educators say they are working to build programs into their curriculum to combat hate. “We are trying to focus proactively on creating an inclusive culture and climate in a preventative way,” said Sara Ahern, superintendent of schools in Franklin, where swastikas were scrawled on school buildings and playground equipment three times last year and again earlier this month." 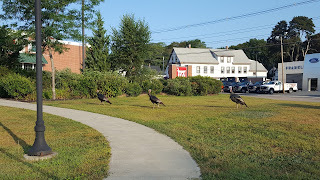 "For more than 100 years, there were no wild turkeys in Massachusetts. Hunting and increased development completely wiped out the wild turkeys, but in the past few decades, the large birds have rebounded in a big way. Turkeys are increasingly popping up in urban and residential areas. “It is a great success story we were able to get them re-established,” said Wayne Petersen, director of important bird areas for Mass Audubon. The Massachusetts Division of Fisheries and Wildlife tried in 1911, then in the 1950s and ’60s, to bring wild turkeys back to the Bay State, but the attempts didn’t find success until the late-1970s. That is when adult turkeys trapped in upstate New York were moved into the Berkshires. The initial group of 37 turkeys took hold and thrived. As the wild turkey population grew, MassWildlife caught some of the birds and brought them to other parts of the state and turkeys soon became a re-established species."